As a non-profit, totally volunteer run charity, we rely entirely on the generosity of donors and fund raising efforts to allow us to continue providing a safe place for the cats and kittens in our care. Our dedicated team of volunteers provide care and support for our cats and kittens 7 days a week, 365 days a year, so your donations are vital to us in order to keep the rescue open. There are loads of ways in which you can support us. Here are some of them. Additional donations on top of the membership fee are always welcome! At Oldham Cats, we NEVER put a healthy cat to sleep, so any cat for whom we can’t find a home will become a permanent resident. There are always hungry mouths to feed at Oldham Cats! Your support will help keep our residents happy and healthy. If you choose to help us via sponsorship you can either sponsor a cage (where cats and kittens await adoption) or one of our permanent resident cats. Check out the residents who are looking for Sponsorship in our Sponsorship Category. As a valued sponsor you will receive a written update about your resident twice a year (summer and Christmas), complete with photo. You are also welcome to visit the rescue during opening times. 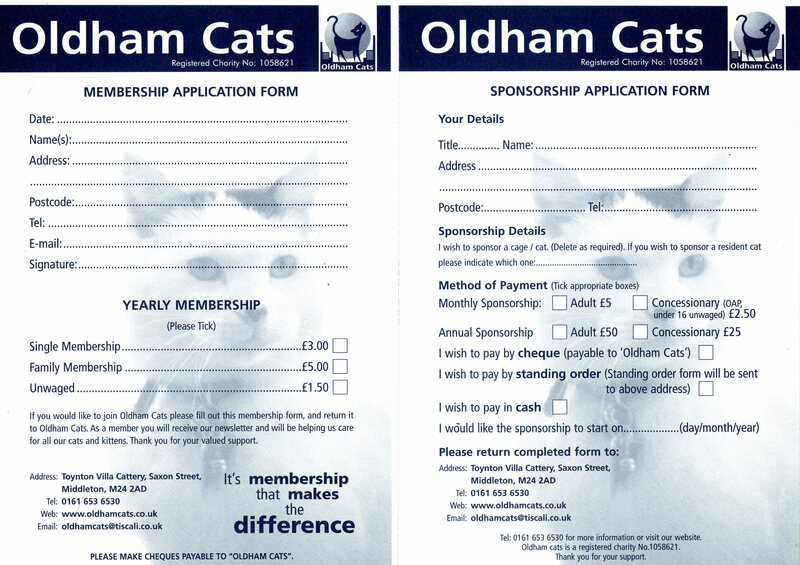 Here are our membership and sponsorship forms which you can print out. 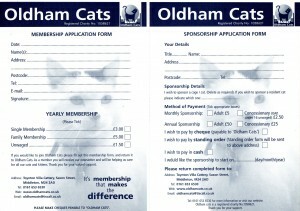 Alternatively, forms are available from the office at the rescue. Our postal address is located on the Contact Us page. Please remember that you can donate good quality items, by bringing them directly to the rescue during opening hours. We have two main fundraising events each year. Our Summer Fair is held at the rescue and our Winter Fair at a community centre. Dates and details are posted on this website under News. We also sometimes run tombolas and other fundraising activities at other venues or events. We’re always grateful for any donated goods – tombola prizes, second hand goods, handmade things, etc – everything is gratefully received. We accept things at the rescue during opening times. And please, come along to our summer and winter fairs, there’s loads of lovely stuff to buy and always a great atmosphere.